Rich Dweck response to this insanity!- 5/13/13 The bottom line is if LGBTQ people look at the Middle East and try and ally themselves with Pro-Palestinian lobby in order to align themselves with underdogs need to look at the whole picture. Israel offers more gay rights to LGBTQ people than anywhere else in the middle east. If the Palestinians were given the entire state of Israel, then this would only secure an ANTI-LGBTQ state that will persecute LGBTQ people like the other Arab countries." "Think a little about the entire picture, before you think you are taking the sides of those you think are the underdogs! It is like being in America as an LGBTQ person and voting for the Republicans. Voting for those that persecute you is the antithesis of what we should be doing as an LGBTQ person. We have to stand up for our rights and support those that support us. You can call what Israel is doing as Apartheid and more, but get the full story. Understand both sides before you start calling Israel the persecutors! Article in the Daily Beast- 5/1/2013- In the last eight years, the Israeli government has sought to rebrand Israel as a “liberal haven” for gay rights in an otherwise-homophobic Middle East as a means of increasing tourism and international goodwill. Critics refer to the campaign as “pinkwashing,” an attempt to whitewash the Israeli occupation by focusing on gay and lesbian issues. Many of these critics are queer people themselves, and their movement against Israeli policies is building within the LGBT community. But recent pro-Israel initiatives hope to change that; rather than simply promoting Israeli gay images in the international sphere, these Israel advocates are actually attempting to sanitize LGBTQ spaces of pro-Palestinian activism entirely. 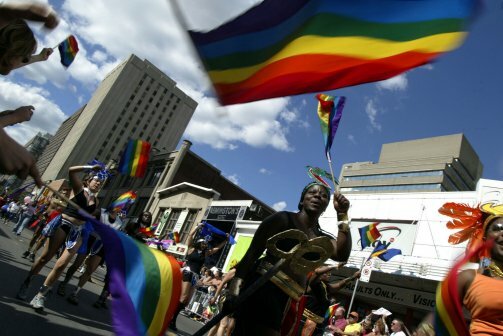 The most recent battleground is Toronto, where Councilman James Pasternak has proposed offering extra money to the Pride parade if the organizers prevent pro-Palestinian group Queers Against Israeli Apartheid (QuAIA) from marching this June. Pasternak had previously attempted to withdraw funding from Pride altogether, claiming QuAIA’s use of the phrase “Israeli Apartheid” constituted hate speech; when that failed, he proposed granting what he calls a “diversity bonus” if Pride keeps QuAIA off the roster. Pasternak’s idea is simple: we straight people will only support you if you exclude any dissenting voices. Unfortunately, this thinking isn’t limited to straight people, and many in the gay community—especially gay Jews—are also attempting to keep LGBT spaces clear of any pro-Palestinian sentiment. Two years ago, a small group of gay Jews successfully campaigned the New York Gay and Lesbian Center from allowing Siege Busters, another pro-Palestinian group, to hold an event, claiming the group’s politics made them feel “unsafe.” As they see it, Israel is a natural “ally” to the gay community—so what does that make pro-Palestinian gays? The anti-Zionist movement within the LGBTQ community is confined to a small margin of the queer community, led by respected queer academics. It’s important to understand the differences in the mnemonic of the LGBTQ spectrum to understand why some of the Q (queer) in the LGBTQ community protests Israel. Queer politics encourages the dismantling of barriers and walls and views Israel as a direct paradox to queer theology. It is a theology that rejects ‘walls’ (such as the separation wall) and anything that separates people. Queer history views the LGBTQ community as victims of separation and inequality and empathizes with the Palestinian people as victims of separation and inequality. In other words, the “queer” radicals cannot be taken seriously because their politics are a “theology” that stems from some kind of inalienable identity. But just as it would be anti-Semitic to discount the Zionist politics of people like Pasternak and Littman as products solely of their Jewish ethno-religious identity, it is homophobic to discount the voices of Palestinian and pro-Palestinian queers as a function of their queer identity.